Within the Christian tradition there is a stream of thinking that leads our eyes to look more carefully at the earth and our material lives for the signs of God’s grace. Rather than just seeing God in the heavens, God is found to be present in the things we touch in our ordinary lives. Australian indigenous artist Shirley Purdie draws on her cultural tradition to locate the presence of God within the skin of her land. Her work is literally painted with the earth, as she collects ochres from the land she is responsible for and mixes it with glue to attach to her warm hued canvases. This is literally the skin of the land, the texture and tactile presence of the ground that your feet will walk over. This contact through touch is the means by which Aboriginal people read the land to find evidence of their history and their connection to who they are as caretakers of this environment. This is exampled in the work Ngambuny Ascends, that places the Ascension of Jesus (Ngambuny) within the local landscape of the famousBungleBungleRanges of western Australia watched by the loving figure of Mary. What is striking about Purdie’s work is its capacity to articulate the local landscape as the site for the divine story. The drama of the scene is shaped within the forms of the local landscape and most centrally by a dense swathe of black ochre that locates the image in space and time. European eyes would by convention be looking to the sky, as this is the pathway by which Jesus ascends into heaven attended by puffy clouds and soft pink and blue lights. In stark contrast to this the space for ascension is rendered black, like skin, like crevices in the rock, like a void open to receive. Such void spaces appear as spaces for strong dreaming, as water holes that sustain life or, in this case, as the place where the land receives the Spirit of Christ returning. In Aboriginal culture black is the colour of skin, of connection and touch. It does not carry European associations where black is the space of fear, darkness or sin. If there is place for bright shining holiness, it is in this void. This is a holy place represented in a way that reminds viewers of the felt intimacy of skin, the surface touch of human relations. What is most striking is that Ngambuny, the Christ figure, does not ascend into the sky but back into the land where God as Creator Spirit resides. Christ does not go to a God in heaven, removed from human and social life. Rather, Christ is alive in the land. Some Aboriginal people point out the oddity of heaven being in the sky. There is nothing in their culture about heaven and hell. They believe that when they die their spirit goes back to their Homeland, which is their promised land, their heaven. Christ is alive! You just need to take off your shoes and socks and make contact with the land. This has an important implication for a sense of connection not only with God but with the earth. It also raises questions for us about how we see God at work in the earth and the world of material things. It is clear that Aboriginal respect for the land as sacred was mistrusted by nineteenth-century missionaries as an animistic religious form and was replaced with the training of an eye on heaven. Cultural mistrust led to the destruction or repression of images and art works during the missionary period. The blackness of skin, and the stark shadows of the outback environment were signs of otherness that left a hostility towards indigenous culture. There was a lack of appreciation of its capacity to sustain a strong and healthy spirituality. In contrast, Shirley Purdie in her richly tactile depiction of the Ascension of Jesus offers an invitation to touch the earth and see God. 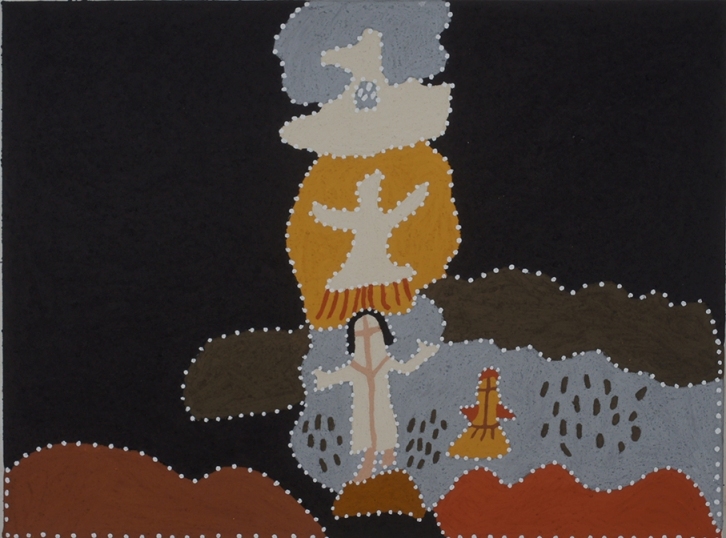 Shirley Purdie, Ngambuny Ascends, 2013, natural ochre on canvas, 60 x 80 cm, private collection. Used with permission of the artist and the Warmun Art Centre in Warmum, WA, Australia. The Rev Dr Rod Pattenden is an art historian and educational facilitator. He has written widely on aspects of contemporary art, spirituality and issues of justice. He is Chair of the Blake Society that runs the annual Blake Prize and is minister of the Adamstown Uniting Church in Newcastle, Australia. For more, see www.rodpattenden.id.au.